IoT devices will bring a new level of connectivity to our homes and workplaces. 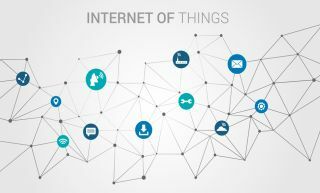 IoT, short for the internet of things, is a vast network of vehicles, home use appliances, physical gadgets and other electronics, sensors and connectable software which enables these gadgets to exchange data with the internet and other gadgets. This terminology came into existence in the late 90’s and was created by Kevin Ashton. The internet of things allows devices to be controlled by other machines within the same network. As a result, this increases effectiveness, the efficiency of the work and reduces the risk of human error. These devices can control and exchange information within different gadgets and can communicate through the network. When we talk about the ‘things,’ we can decipher it to be the multiple gadgets with built-in sensors and software. The Internet of Things is nothing like it was just a few years ago. It is growing rapidly and devices that previously only had a few functions are now becoming more and more advanced. Simply stated, the internet of thing is just about anything that connects to the internet and using it enhances its abilities to perform. In order to benefit from the internet of things, you’ll need a fast and steady internet connection. In 2019 alone, around 3.6 billion devices that were connected to the internet were used for daily tasks. Data experts have analyzed this and have said that the internet of things will most likely increase and keep on doing so for a long period of time. Since 2015, the number has gone from millions to billions in the span of just one year, this rate is both exciting and alarming at the same time. Around the end of 2016, ‘The Malware of the Internet of Things’ came into existence and could infect any device in the IoT spectrum. This malware has the ability to access the IoT devices by using default usernames and passwords and then make them eligible for DDoS attacks. The attack in 2016 flooded one of the largest operating websites in the world. This malware makes code accessibility easy and this code can be altered by anyone. Cities will now become smart because of their information gathering devices such as surveillance cameras and video kiosks will be connected to the internet. They will have enhanced jobs to perform which they will be able to do more effectively and with little chance of error. People have already started investing in ‘smart homes,’ where the home is fully equipped with gadgets such as Nest thermostats and Philips Hue light bulbs. Market research suggests that the smart home industry will reach around 53 billion dollars by 2020. From coffee makers to refrigerators, to homes and indoor and outdoor lighting, every smart device connected to the internet will learn its user’s patterns and habits and will respond accordingly through learning. Machine learning is a term which means that computers will start learning through a process and won’t really have to be programmed by a person. Routers are kept in homes and most do not have security installed, hence they are very vulnerable to hackers and cyber threats. With so many companies now working in the IoT industry, routers are being produced without security enhancements. Hackers are aware of this, so just having firewalls enabled and passwords won’t stop routers from being affected by malware or from being hacked. The Norton Core Router is the first of its kind, a secure router with built-in antivirus and malware capabilities. Its purpose is security. Ranging from DNS to the encryption of data and security updates which are automatic and regular, Norton has it all. It is available for purchase in different packages. IoT has a dark side to it as well – data security. Because of the number of advancements being made in such a short period of time, security has been an issue. Data breaches have become prevalent among IoT devices. These issues will need to be addressed in the near future. It’s important to understand the security issues in order to prevent viruses and hackers from attacking and accessing personal data. IoT has a dark side to it as well – data security. Because of the number of advancements being made in such a short period of time, security has been an issue. Data breaches have become prevalent among IoT devices. These issues will need to be addressed in the near future. It’s important to understand the security issues in order to prevent viruses and hackers from attacking and accessing personal data. Experts have predicted that this will be wide spread by 2020. Cars will be connected to the internet and will have the ability to be driven automatically with built-in internet services that will enhance the car’s functions. It should be noted that Google is already there, they have and started testing autonomous driving. It is safe to say that the “Internet of Things” is the future. Over time, it’s expected that many aspects of our life will be managed by IoT. From agricultural development to aircraft advances, each industry is excited about the possibilities of embedding the internet of things in their products and services. Only time will tell what the future of the Internet of Things holds, but everyone is talking about it and focusing on this new era.